Kerstin is from Austria and discovered her love for the sea quite early on, largely inspired by endless re-runs of Jacque Cousteau movies. This eventually led to a university degree in marine biology. It was a logical step for her to start diving as well and this completely changed everything. In trying to escape the cold lakes of Austria she travelled around the world for a while until she finally arrived in, mostly warm, Egypt. 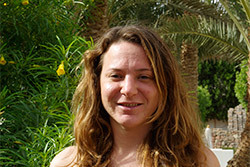 Kerstin is now Partner of TBI and a TDI Instructor Trainer, TDI Advanced Trimix Instructor, PADI TecRec Full Trimix Instructor and is focusing on the Hollis CCR PRISM2 and underwater photography.